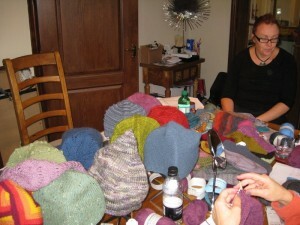 I’ve realised that I never posted about the Hat Design Workshop I went to. It was hosted by Kath of Little Houndales Knits and taught by Woolly Wormhead (so sorry about the picture – believe me this is the best one). The maths underlying knitting is always fascinating to me, so it was great to learn about the maths of hat design, in particular how just the rate of decrease affects the style of hat. I’m still working on the hat I started at the workshop – a beret with three cables spiralling in to the centre – and it is in quite dark yarn, so not really an evening project. Since evening is when I get most knitting time, I’m not sure when it will be finished. Apart from all the cakes (including a fabulous Sachertorte), the other great thing was trying on all the different hats and seeing which styles suited which people. There was one participant who looked amazing in every hat she tried. I did not, but I did find that the most flattering hat style was one I used to wear many years ago. 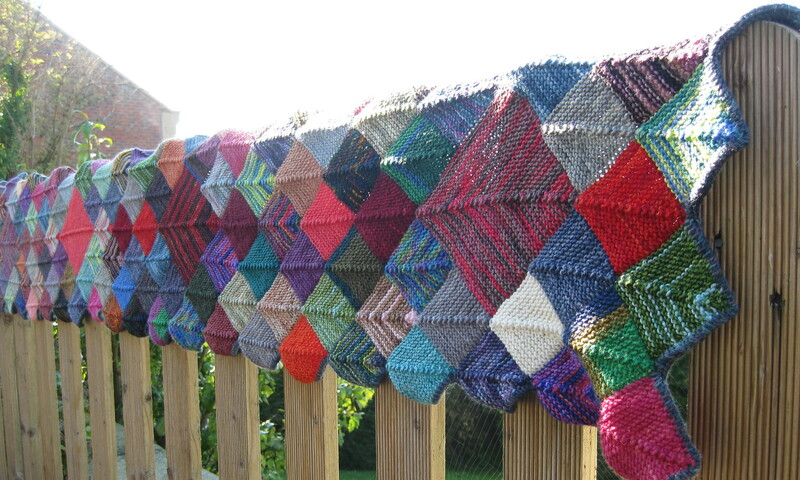 Looks like I’ll be knitting a Camden Cap before too long. In lieu of a finished hat, here is a finished scarf. 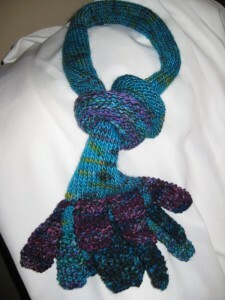 Doughnut Scarf from Colinette Yarns. While I love the colours, this fails the scarf’s primary objective, that of successfully keeping the neck warm. I’m not sure I’ve yet managed to make a scarf that is functional. Ah well. Still, it used up a whole load of scraps for the fingers. This does beg the question of why a scarf needs fingers. I think this will probably be for the dressing up box when the kids are older.